In typical fashion, I missed the boat on one of those patterns. You know the patterns I'm talking about -- everywhere you look, it seems people are knitting them. In this case, I'm talking about Ishbel. I bought the booklet containing the pattern a couple of months ago, but I couldn't decide on what yarn to use. Finally, I remembered that I had a really pretty skein in my stash that hadn't been touched since I'd purchased it sometime last year (I think). 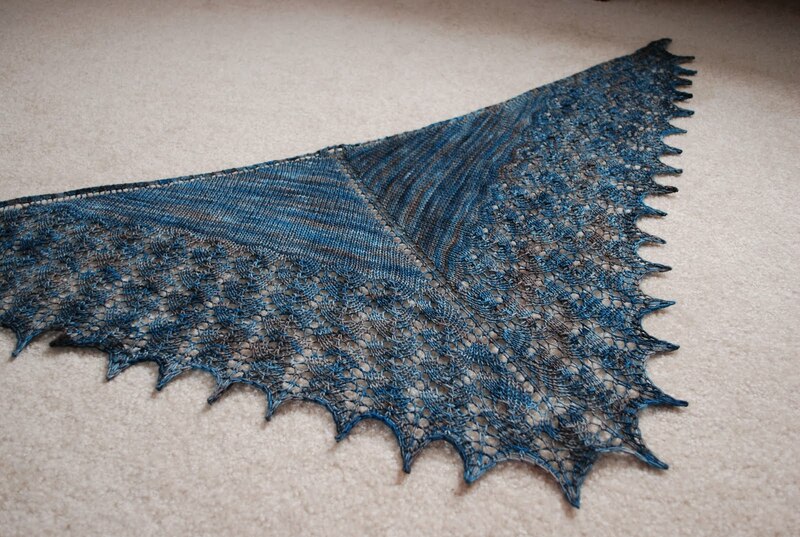 There isn't much to say about this shawl that probably hasn't already been said. 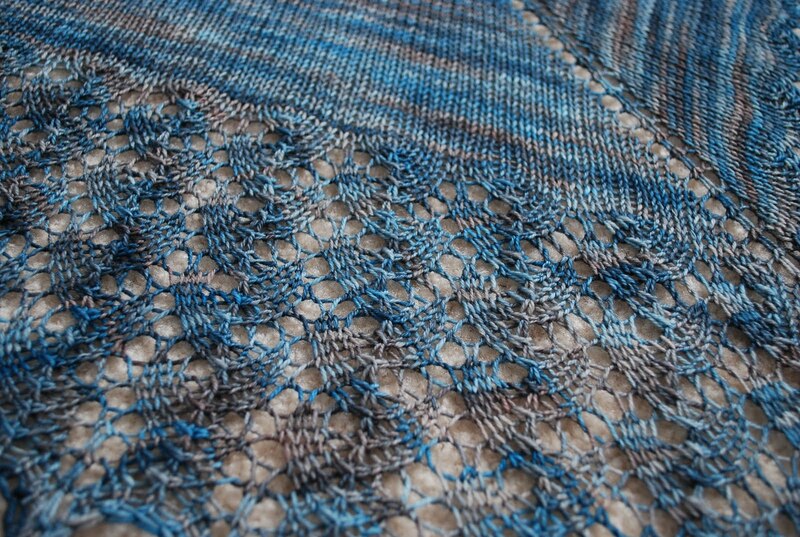 It's a fun, quick little knit, with just enough lace to be entertaining. The fact that I finished it in a week with a baby in the house says a lot. I'm looking forward to wearing this in the mornings for my walk into work; it's still been fairly chilly here most mornings, and I've been wearing my Swallowtail Shawl to death the past several weeks. It'll be nice to have an alternate. I also seem to have caught the lace bug again and have become enamored of small, shawlette-sized pieces, so I've cast on for another one -- Traveling Woman in some of my handspun Falkland. It feels good to be knitting productively again! It figures that I finished a lovely pair of mittens just as the weather is getting really spring-like. That'll teach me to start a project when I'm 39 weeks pregnant! 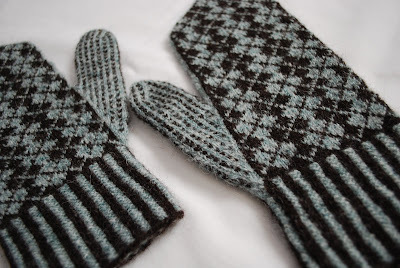 These were a lot of fun to knit. I'd acquired the yarn from Kenny some time ago; he'd started a vest with this yarn and decided he no longer wanted it, so I benefitted from his leftovers. 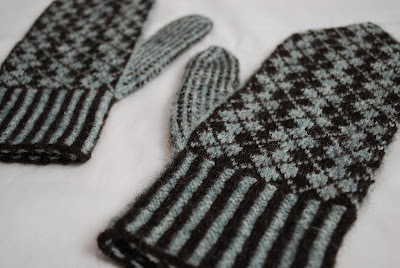 This was my first experience knitting with Shetland, and I quickly discovered why it's so often favored for color work. This stuff is sticky! Several times while I knit these mittens I inadvertently dropped a stitch, but because of the hairiness of the yarn, those stitches went nowhere. This is the stuff you could use for a steek that doesn't need to be reinforced before you cut. I wouldn't say that this yarn rates among my favorites, though. It's a tad bit on the scratchy side -- enough that I wouldn't use it for anything that's meant to be worn next to sensitive skin -- and I found it to be spun rather inconsistently. And while the finished pattern looks great, this yarn doesn't have the distinctive stitch definition that I usually like. Still, I'm quite pleased with these mittens and really enjoyed knitting them (don't let that start to completion span fool you!). When I started them, I was sure Rainbow was going to be late and I thought I'd be able to squeeze them in before she arrived, thus giving me something I could actually use during the winter. Instead, these will be packed up for next winter -- something to look forward to! 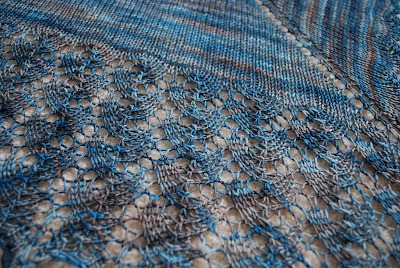 This was meant to be posted yesterday for Spinning Sunday, but I was foiled by a cloudy weekend and didn't have good light for taking pictures -- at least not pictures that could do this yarn justice. 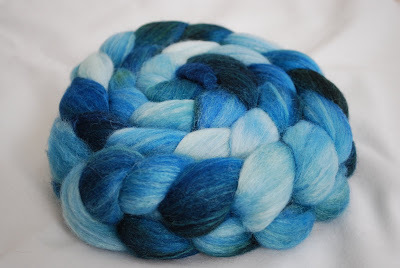 I haven't participated in the All Spun Up spinalongs for a while because of my limited time to spin since Rainbow was born, but when I heard that the fiber for the April/May SAL was a BFL/silk blend, I knew I couldn't miss it. I also had a feeling that it was going to be in colors I'd like. The fiber did not disappoint. Some people had spots of green in their braids, but mine was pretty much all shades of blue with some white. I really wanted to spin this into a laceweight yarn, because I knew that the luster of the BFL combined with the shine and strength of the silk would make for a gorgeous thin yarn, but I also knew that I might never finish if I tried to spin lace again (I haven't forgotten how it took me almost a month to spin the laceweight Shetland). Instead, I decided to spin it a little thicker, if only in the interest of getting it done so I could enjoy it. The finished yarn is about sport to DK weight, and my four or so ounces yielded approximately 245 yards. I had a little bit leftover on one bobbin that I chain plied, but I haven't yet finished it or measured it. 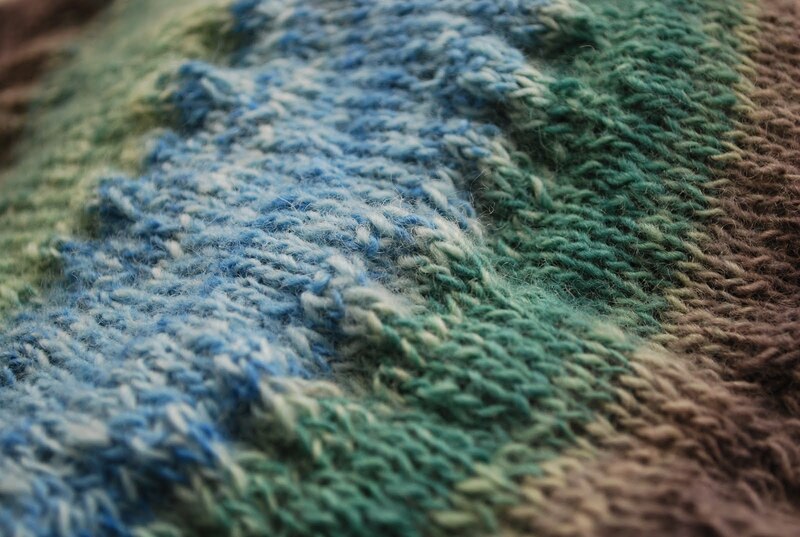 The beauty of this yarn is really nearly impossible to capture. It is amazingly shiny and soft, and the depth of blues is just not done justice by these pictures. 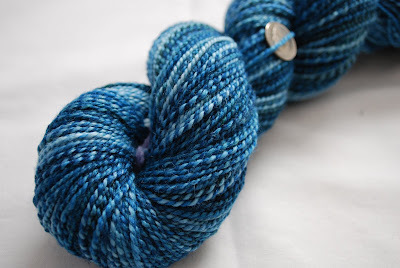 It's quite possible that this fiber blend is my new favorite. 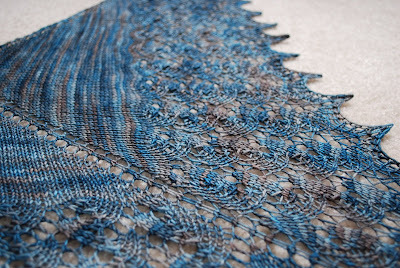 Next time I have an opportunity to get my hands on some, it will definitely become laceweight. As to this yarn, well, I think it'll make a really luxurious cowl or scarf -- eventually. 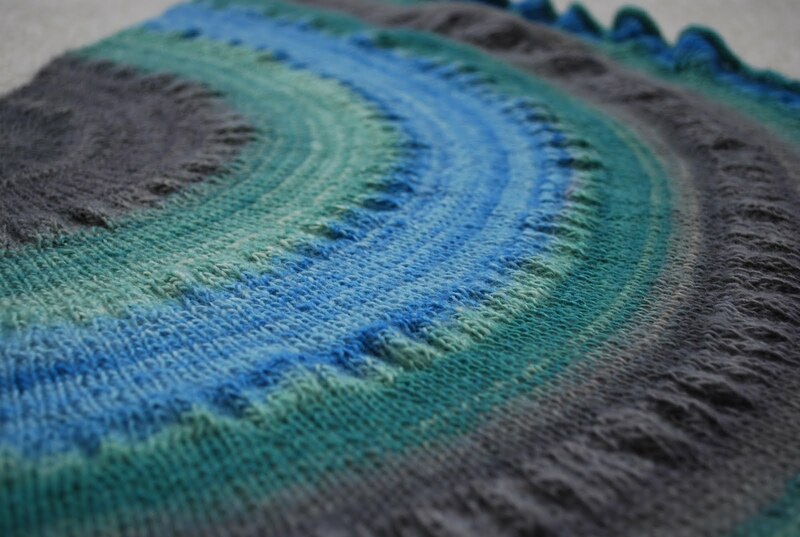 Next post: an actual finished knitted project! 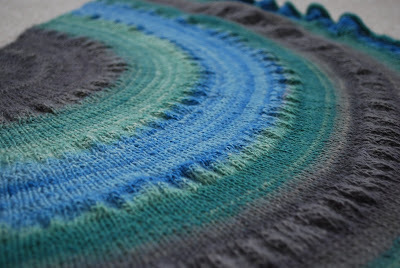 One of my favorite things to do on Ravelry is visit the "fiber to finished object" threads on various spinning boards. I love seeing how the original fiber -- sometimes even in the form of a fleece -- becomes yarn and then a finished project. I have one of those to share with you today, and now I can reveal exactly what it was that you saw in that sneak peek in my last post. 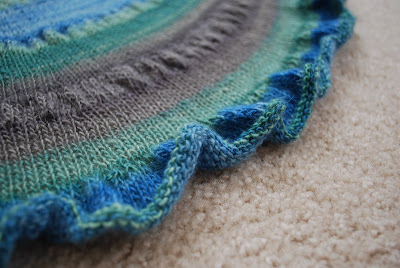 In this case, I started out with this fiber from Sakina Needles that I purchased nearly two years ago from the Loopy Ewe. 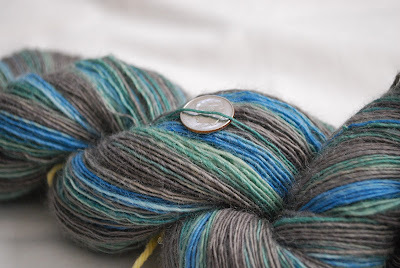 It was BFL (that's blue-faced leicester, for those of you who don't speak sheep) in a colorway called Smokestack. I started with four ounces. Because BFL is a longwool, meaning it has a long staple length (that's the length of an individual hair), it works really well as a singles yarn. 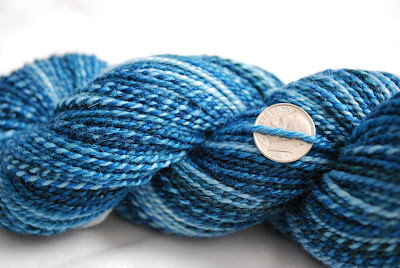 Singles yarns typically use less twist, because without being plied in the opposite direction with another single, too much twist will cause the yarn to kink up. Shorter-stapled fibers, like merino or cashmere, need more twist to hold them together in a yarn, so they are usually better suited to plied yarns. Longwools, however, can hold together just fine with less twist, so that's what I decided to do with my fiber. 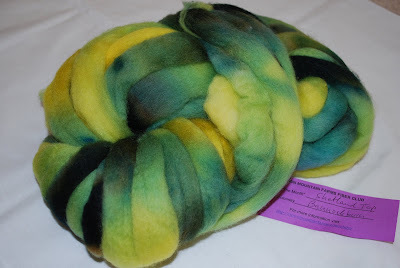 I spun a heavy laceweight single with my BFL. To finish it, to ensure that I worked out as much extra twist as I could and that it would stay together, I slightly fulled it by dunking it in hot and cold baths a few times then gave it a vigorous thwacking against the side of the bathtub. I ended up with about 530 yards. 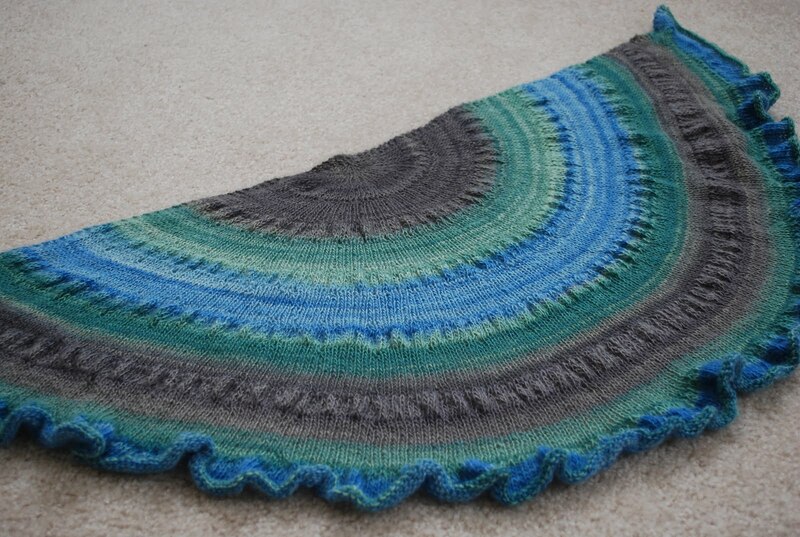 This was a really simple knit and fairly fast -- it only took me as long as it did because those last rows are so long (the ruffle at the end has more than 500 stitches per row! ), and as you know, I have limited knitting time these days. 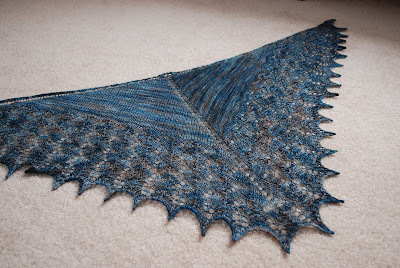 It was an interesting experience to block, because this is the first shawl I've knit that I did not need to be blocked aggressively. I merely smoothed it out and pinned the top edge of the shawl so it would dry fairly straight, and then I pulled at the ruffle here and there so it would ruffle nicely. I'm really quite thrilled with this little shawlette. The yarn developed a really pretty halo while I knitted it, and I love how it striped with the pattern. I think the best compliment I received on it was when I was working on it at Natural Stitches and another customer in the shop asked where she could find the yarn I was working with. Finally I have a couple of questions to answer. Both were left in the comments to my last post. (I try to respond to all the comments I get by e-mail, but sometimes there is no e-mail address associated with the comment and I'm unable to respond.) 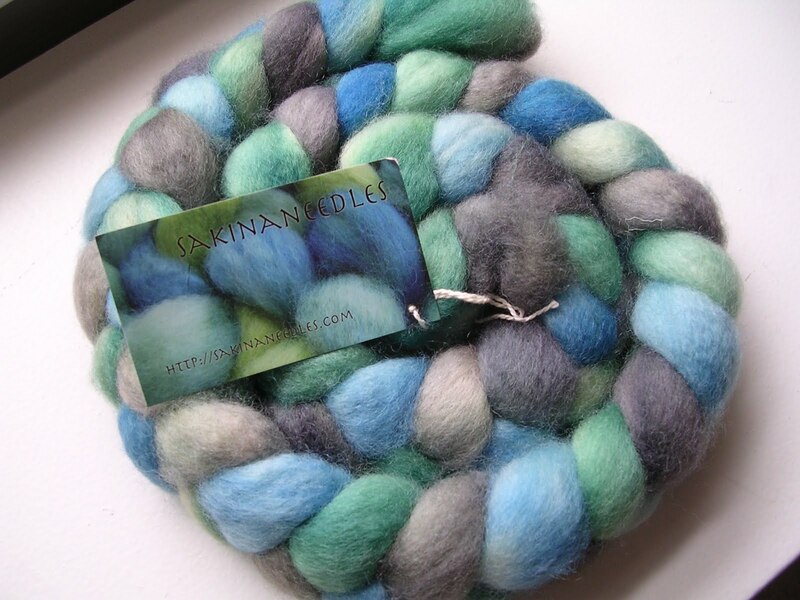 Samantha, of the Fiber Freaks blog, wanted to know how I spin my yarns. Although I first learned the basics of spinning on a drop spindle, I very quickly moved to a wheel. I bought my Lendrum DT about two years ago and have been using it exclusively ever since. Liz T. also wanted to know if I had any cute Easter pictures to share. Unfortunately no, because we don't celebrate Easter. 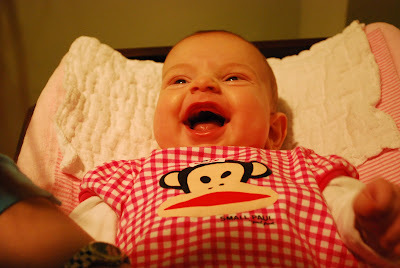 But we have gotten some cute shots of Rainbow recently, so I'll try to sneak a few into the next post. If you're reading this, I want to thank you for bearing with me while I get used to having a baby in the house, working full time, and still managing to get in some knitting and spinning time. Eventually I hope to get back to my more regular schedule of posting two to three times a week, but for now I hate to post when there's nothing exciting to show you. I'd never spun shetland before, but I knew that shetland is often used in lace yarns, so that's what I decided to do. My two-ply laceweight is approximately 595 yards -- not my best lace yardage ever, but it should still be plenty to make something pretty. 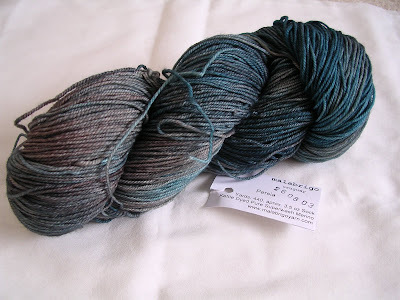 I still have the April shipment (Wensleydale) to spin, but because I'm planning a laceweight singles yarn for that, I need a little break with something thicker. 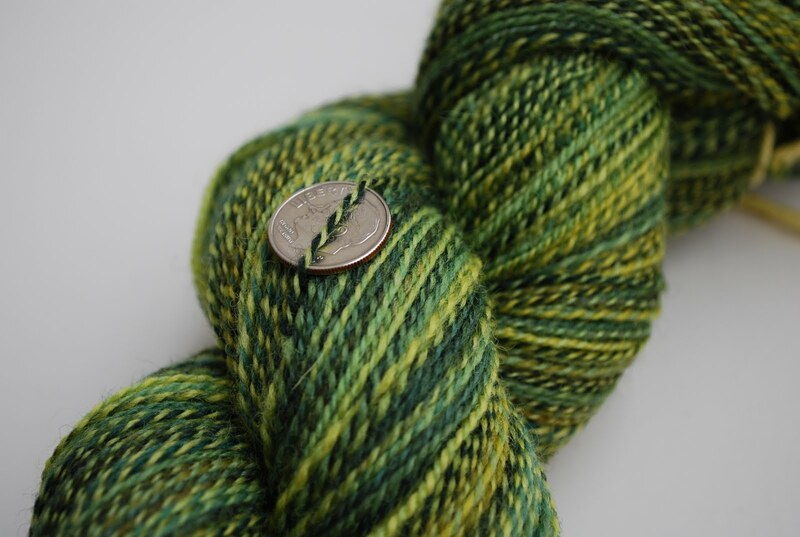 So I started in on some BFL/silk from All Spun Up that is the April/May spinalong fiber. It's an absolute dream to spin and should be finished relatively quickly as a result. That's a good thing, too, because I went a little crazy during the CMF March Madness sale, so I have a lot in the spinning queue.